NOTES: Reboxed Airfix kit. Version not stated on box & instructions. The Skyraider is one of those aircraft which seemed to be designed at the wrong time due to the introduction of the jet engine in the closing days of WW2. Nobody would have imagined the success it would eventually achieve and the long lifetime it remained in active service. No need to say more, as this is an aircraft which is well documented both on printed material and also on-line. There is another review here on MM by Mark Fordham, but the more the merrier. This kit mould is as old as I am and some may wonder why I chose to build it knowing that there is a MUCH better choice in the form of the Hasegawa kit! 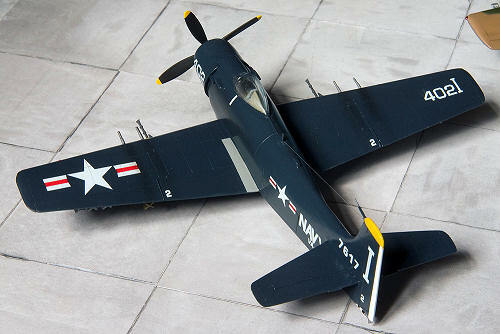 I originally bought it to take the decals from it to make a gloss sea blue Skyraider instead of buying a decal sheet. 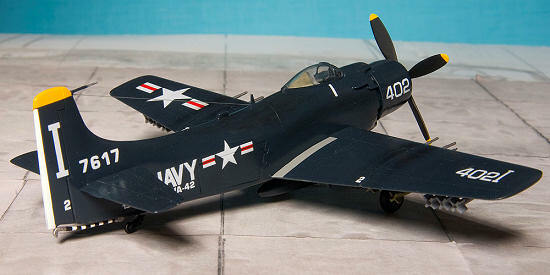 Heller does not mention any information about the version of this kit and is just a “Skyraider” according to the box and instructions (Which are quite unique even to a Heller kit in the way they are presented). 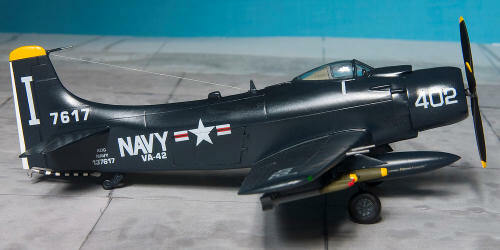 Since it has four 20mm guns it should be an AD-4 or later, but it does not have the armour around the cockpit area. Looking at references in Squadron books, it seems that although the AD-6 did not enter service until the Korean conflict was over, there were quite a few AD-6’s in service in sea blue in 1955-1956. Upon checking the kits dimensions and shape with that of the Hasegawa kit, I found that it was very close in most aspects. The most obvious differences are the canopy position and the canted tailfin. 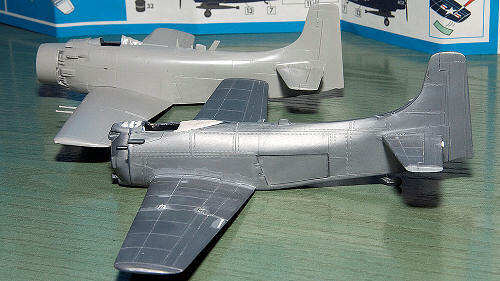 It also lacks detail and is covered with 1 (scale) inch rivets which is expected from a kit more than 40 years old. But the sea blue scheme would not reveal much surface detail and I decide to build it along a Hasegawa A-1H and compare the differences as I go along. First step was to sand down all the rivets and raised panel lines to get a smooth surface. This was done on all the major parts, and the panel lines were rescribed using photos of the real aircraft and the Hasegawa kit. It was the first time for me to rescribe a whole model and was another reason to build this one. Scribing the flying surfaces was quite easy but the fuselage was a little more challenging. After I was satisfied with the result (which is far from perfect by the way! ), I tried to decide what I was going to modify or correct. The tail fin was first place as when viewed from certain angles it really stands out. Straightening this was just cutting off some plastic from both halves and dry fitting while twisting both parts to get a straight fin. I then glued the halves together holding them with clamps in the straight position and left it to dry. I had not built the cockpit area before as I still wasn’t sure if would correct this or leave it as it was, but eventually decided to go on and move the cockpit forward by about 8mm to get it in line with the Hasegawa’s kit position. To move the cockpit forward, I cut the shape of the canopy on the forward part of the glued halves, and then built up the area left blank with plastic sheets and sprue bits. After drying, a lot of sanding and filling got a reasonable shape for the cockpit area. Inside the cockpit I scratch built some detail and modified the seat. The undercarriage is very simplified and the bays are non existent. I removed the rearwards locating points and sanded the area smooth after closing the bays with sheet styrene, which was a mistake as I should have done that while the wings were still apart. I added the spar which runs through the bay and added some ribbing detail. Adding the speed brakes in the closed position require adding some shims in the bay to get a flush fit, and after drying all was sanded in place to get a better fit. The tailplanes are also wrong in their outer shape. I cut off about 3mm from each and glued some plastic with excess area. Later these were sanded down to the correct shape. I also added the small trim tabs on the elevators. You can see all the fixes in the photo with the Hasegawa kit behind it. The cowling covering the radial engine when it is shut down is not included in the Heller kit. It is included in the Hasegawa kit, and using this, I made one from sheet Evergreen styrene by cutting a circle, removing an inner circle where the propeller comes through, then scribing it into sectors and removing on of the sectors, then gluing it back together to get a cone shape. The undercarriage was modified to get it closer to the arrangement of the real aircraft and that of the Hasegawa kit which seems to be quite accurate. I added the small fences on the wings in between the flap and ailerons on the upper wing surfaces from sheet styrene. Another correction I made which I am not sure that I got right is the angle of the main pylons on the wings, those two that usually carried extra fuel tanks. I am not sure if the angle is correct as they are still somewhat pointing a little downwards, but they are surely much better than as supplied. I also tried to make a better looking tail hook by taking the ends of the kit part and replacing the length with a smaller diameter piece of Evergreen plastic rod, and sanding the whole piece smoothly. Although not 100% accurate, especially at the mounting position, it is much better than the standard kit part. Another correction which I made was to move the outer 20mm cannons slightly inboard as they seem to be incorrectly located by the kit. Surprisingly, the wheel hub detail is very good and also seems correct for the Navy aircraft of the period. The fuel tanks are completely wrong, so they went to the spares box, and a single tank came from the Hasegawa kit. Armament came from the Hasegawa Weapons set and from the spares box. I think the rockets came with the Matchbox Panther and aren’t correct in shape, but I wasn’t going to “waste” more Hasegawa armament on this kit. 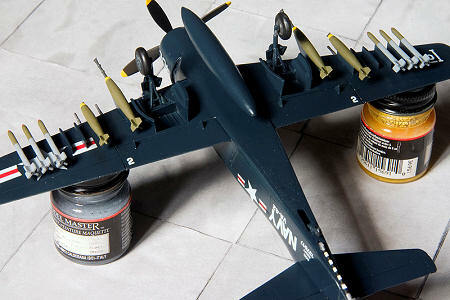 These Gloss sea blue aircraft must be the easiest colour scheme for the modeler. Even the wheel bays and landing gear are in the same colour so it’s a very easy job. This kit was also the first time for me to use Klear (Future) which is not available locally (in Malta). I applied several coats using a soft paintbrush over the Model Master Gloss Sea blue which did not turn out very glossy from airbrushing, and then the decals were applied using a little Klear as a setting solution. These performed flawlessly and I was much happier with these than the Eagle Strike Decals I was applying on the Hasegawa A-1H for a special operations machine. I think that the finish could be better and there are some flaws which might have come from an ageing gloss sea blue bottle rather than the Klear or the final satin varnish coat. Well, I can say that this kit is truly outdated by any modern standards, and the Hasegawa kit is the one to go for in 1/72nd as everybody agrees. I did enjoy building it as I remember building a couple back in Airfix boxes as a kid when it didn’t matter how accurate they were! You still can get a decent Skyraider out of it as the general dimensions are nearly correct, but it takes time and with my skills I cannot get anywhere near to Hasegawa. If only Hasegawa could lower down their excessive price tag for this one, I will buy a few more as I really like the look of the Skyraider, and there are many ways to finish it. Squadron/Signal 5527: A-1 Skyraider Walkaround. Squadron/Signal 1060: A-1 Skyraider In Action. Other sources on the internet through search engines.